Abuse during pregnancy causes harm to the woman and may also harm her fetus. During pregnancy, women who might not otherwise seek health care for abuse are likely to seek medical care for their pregnancy. Prenatal educators who are able to intervene in cases of abuse will help the woman, the fetus and any other children in the family. Prenatal educators are not expected to be experts or to provide counselling. Prenatal education is an opportunity for health care providers to share information about abuse, identify women who are being abused and offer support and referrals to women and their families. It is recommended that all prenatal educators receive education about abuse, become knowledgeable about local resources and learn how to use screening and assessment tools. Prenatal educators should also work with their employers to ensure their own safety when working with families affected by abuse. 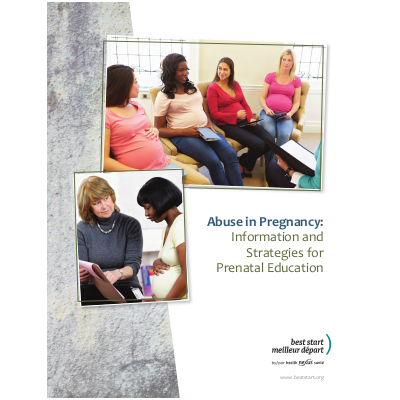 This booklet for individuals working in prenatal education provides information on identifying potential situations of abuse and provides strategies and resources for supporting the woman through the situation. Information is provided about risk factors for abuse in pregnancy, the impact of abuse on women and children, screening for abuse, disclosure and legal issues.